August 2017’s national index comes in at 195.05, a 6.1 percent year-over-year increase from August 2016 and a seasonally adjusted 0.1 percent month-over-month increase. Coupled with a strong economy, mortgage rates that remain historically low are creating market conditions that support home prices reaching all-time highs. But as the Fed bumps up short-term interest rates, demand is expected to weaken and eventually soften the cost of housing. 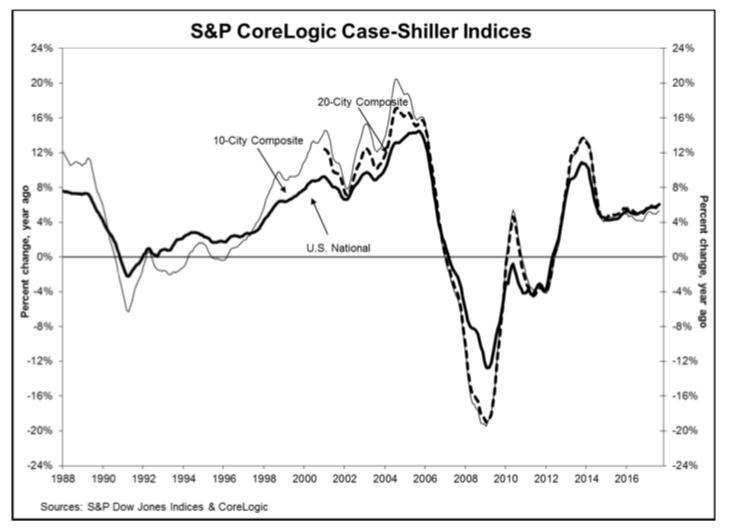 The 10-City and 20-City composite posted 5.3 percent and 5.9 percent year-over-year gains, respectively, and the cities of Seattle, Washington; San Diego, California; and Las Vegas, Nevada led the way. Seattle reported a 13.2 percent year-over-year price increase, followed by Las Vegas with an 8.6 percent increase. San Diego shored up the end of the pack with a 7.8 percent increase. The 10-City and 20-City composites reported 0.5 percent and 0.4 percent seasonally adjusted month-over-month increases, and only San Francisco reported a negative (-0.1 percent) monthly price change.